Why Trade EURO STOXX 50 ‏(EU50) with XM? At XM we offer EURO STOXX 50 ‏(EU50) as cash and futures CFDs. Our cash index CFDs are undated transactions that aim to replicate the cash price of the underlying index, and so they are adjusted for interest and dividends. Index futures CFDs expire on specific future dates and are cash-settled on the expiry date. The EURO STOXX 50 (EU50) is a blue-chip stock index that represents the 50 largest and most powerful companies of the 12 European Union member states. It was introduced in 1998 and designed by the index provider STOXX, which is owned by the German Deutsche Börse Group and the SIX Swiss Exchange Group. Traded on the German derivatives exchange Eurex and comprising the 50 most liquid stocks in the eurozone, the market capitalization of the EURO 50 (EU50) is estimated to over €1.893 trillion. 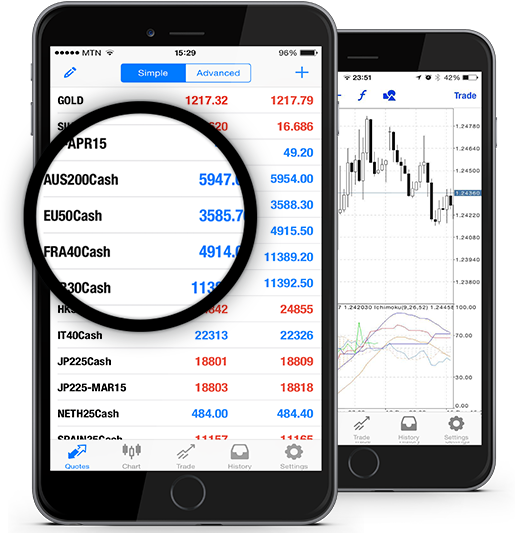 The index is available in EUR, USD, CAD, GBP, JPY, with its components reviewed once a year, and calculated with the Laspeyres index number formula method. A strict selection system, including fast-entry and fast-exit rules, ensures the stability of the EURO 50 (EU50) so that only the performance of the biggest and most liquid stocks are represented. How to Start Trading EURO STOXX 50 ‏(EU50)? Double-click on EURO STOXX 50 ‏(EU50) from the “Market Watch” to open an order for this instrument.